Maryland Sea Grant launched this monograph series on the Chesapeake Bay, entitled Chesapeake Perspectives, as a platform for scholars, researchers, and other experts to share their insights into the Bay's physical, biological, and cultural complexities, its mysteries and conflicts. The series of invited essays features a wide range of thinkers, including anthropologists, biologists, fisheries experts, environmental policy experts, and others in the social and physical sciences. Copies of Chesapeake Perspectives are available for $9.95 each for the first three volumes, and $12.95 for the fourth and fifth. A free review copy may be available to educators and others. For information, contact us at communications@mdsg.umd.edu. Book, 72 pages. UM-SG-CP-2017-01. $12.95. Book, 126 pages. UM-SG-CP-2011-01. $12.95. This monograph is a major assessment of the state of key species in the Chesapeake Bay — the eastern oyster, blue crab, striped bass, and Atlantic menhaden — and of the prospects for shifting from single-species fisheries management to multispecies and ecosystem based fisheries management (EBFM). Edward Houde summarizes current management efforts, potential implications of climate change, disease challenges, and the need for new science. The eastern oyster has limited prospects for natural recovery in the Bay, although aquaculture, Houde notes, shows a promise with its increasing emphasis in Virginia and emerging growth in Maryland. While the blue crab has experienced low recruitment in recent years, new management controls such as setting exploitation rates and creating sanctuaries appear to be having an impact on stocks. Meanwhile coastwide management of the striped bass fishery over these last two decades has been effective with the stock at high levels. Atlantic menhaden, heavily fished coastwide, are not on the verge of collapse, though recent stock assessments indicate that it has been more exploited than had been thought. Traditional single species management aims at producing sustainable yields by regulating catch and fishing effort; however, it does not account for other important factors that can affect fisheries production, factors such as predator-prey relationships, climate change, habitat variability, and disease. A priority goal of EBFM is to foster high yields while maintaining the structure and function of the ecosystem. Because of many scientific uncertainties, the emphasis must be on precautionary management. In developing EBFM approaches in the years ahead, Houde suggests, new governance structures may well evolve to meet its requirements. Book, 36 pages. UM-SG-CP-2008-01. $9.95. William Matuszeski examines efforts to restore the Chesapeake Bay and what is at times an uncomfortable relationship between scientists and managers. He notes how “sound science” can be used as a compass to guide restoration efforts or as a label to pay lip service. In some quarters, he says, the notion of “sound science” has even been used to stall environmental efforts. He argues that the Chesapeake region benefits from a cadre of world-class researchers, but that there can be a mismatch between the rapid demands of political pressure and the much slower pace of scientific inquiry. He points to several examples and in each case suggests whether it was science or politics that won. Matuszeski draws on long years as a Bay manager — he served in a number of capacities at the federal government and was Director of the EPA Chesapeake Bay Program from 1991 – 2001. He concludes that managers have no choice but to depend on scientists for the best information possible. There are, he says, few other places where the interplay between land use, runoff, and coastal waters is so well studied. In the end he describes a management approach that accommodates a dramatic tension between science and management, and ultimately benefits from it. Book, 54 pages. UM-SG-CP-2006-02. $9.95. Erve Chambers questions the often expressed view that Bay cultures are "dying." According to Chambers, a characteristic that most defines the iconic Eastern Shore watermen is their resilience, their capacity to make do. Watermen and their families pass down a range of skills, the daily lessons of life. These skills and beliefs form part of what Chambers calls "cultural heritage," a genuine form of inheritance that he contrasts with the "public heritage" we so often see in museums and tourist shops. Chambers draws clear distinctions between private heritage that develops through the local connections of families and communities, and public heritage that is often connected to regional or national history — the publicized stories we tell ourselves that often become codified but which may lose contact with genuine roots of experience. Chambers expresses a deep faith in the ability of local communities to adapt and change, and worries that we may be conceptually forcing Bay communities into the rigid — even if celebratory — visions we have of them. Book, 46 pages. UM-SG-CP-2006-01. $9.95. Michael Paolisso argues that we have defined environmentalism too narrowly. Describing issues that face the Chesapeake Bay, such as excess nutrients from agriculture and the contentious blue crab fishery, he describes the ways in which we may misunderstand each other and therefore fail to join together in common purpose. Paolisso considers the ways in which farmers, watermen, scientists, and activists all value the environment. He argues that each group has its own set of deep-seated beliefs that form the foundations of their "cultural models." Paolisso contends that because we discount the validity of different cultural models, we often neglect to include watermen, farmers, and others as "environmentalists," and therefore fail to take full advantage of their own strong ethic for preserving both the soil and the Bay. Brush, Grace. 2017. UM-SG-CP-2017-01. $12.95. 72 pp. Houde, Edward D. 2011. UM-SG-CP-2011-01. $12.95. 126 pp. Matuszeski, William. 2008. UM-SG-CP-2008-01. $9.95. 36 pp. Heritage Matters: Heritage, Culture, History, and Chesapeake Bay. Chambers, Erve. UM-SG-CP-2006-02. 2006. $9.95. 54 pp. 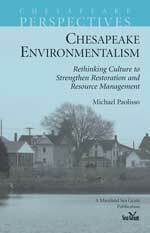 Chesapeake Environmentalism: Rethinking Culture to Strengthen Restoration and Resource Management. Paolisso, Michael. 2006. UM-SG-CP-2006-01. $9.95. 46 pp.